What is the Classical Pilates Repertoire? I often get asked what the difference is between the classical and dynamic Pilates. With the ever popular dynamic Pilates workout people are often confused unsure which Pilates method they should be doing. Firstly, lets briefly look at what Pilates is and how it became what it is today. Then I will explain the different styles. Joseph Pilates, the creator of Pilates exercise developed a series of hundreds of exercises throughout his lifetime. These exercises comprise the classical Pilates repertoire. The original Pilates repertoire is taught in a specific order, which consists of various levels and follows the set of principles laid out by Joseph Pilates. Pilates exercise as a mind/body-type of exercise forged by it principles: Breathing, Concentration, Control, Precision and Fluidity. Classical Pilates follows a set methodology, and like any other discipline, it takes time and skill to master the technique and learn the exercises. It’s basic premise is body control and movement. The movement flows without holding positions against a timer. The levels in classical Pilates are set according to the exercises, their complexity and coordination difficulty. Therefore, showing up to an intermediate level class first time, would be like showing up to an intermediate golf, tennis or karate or ballet class. Especially, because the more advanced exercises are much more complex in movement patterns. Advanced classical Pilates exercises are multi-planar, athletically derived, difficult to execute and very choreographed. In the classical Pilates method technique is cardinal. most importantly, you are expected to execute it with precision and concentration in order to achieve total mind-body control. Moreover, classical Pilates is actually dynamic in essence. The intensity increases and the flow intensifies as you progress to the advanced classical Pilates exercises. Certainly, you’re able to recruit more muscle groups and achieve greater control of your body, which in turn allows you to execute more difficult movements with greater precision. The classical Pilates Repertoire is constructed from the classical Pilates floor repertoire and most exercises can be performed in every Pilates piece of equipment, such as the Cadillac, Stability Chair and barrels. 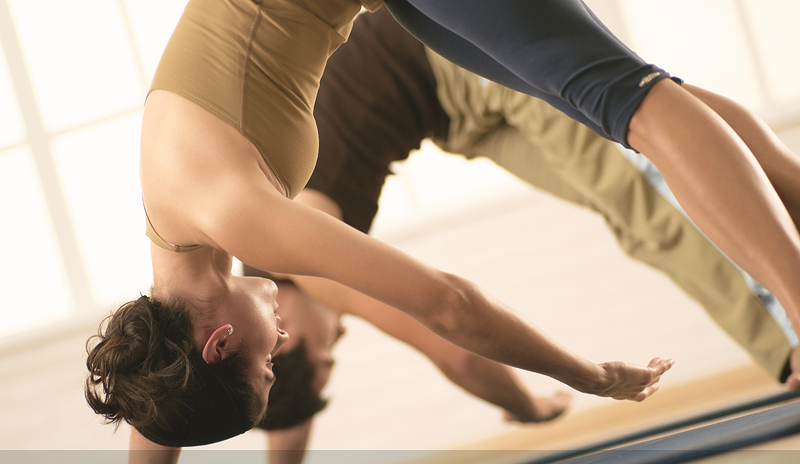 Classical Pilates has evolved throughout the years. Since Mr Pilates’ death, contemporary methods, such as STOTT PILATES® have emerged. Contemporary method STOTT PILATES® is based on modern principles of exercise science and rehabilitation. STOTT PILATES® draws on proven and accepted practices in sports science and evidence based rehabilitation while preserving the original repertoire created by the late Joseph Pilates. Dynamic Pilates is a fitness oriented workout on the reformer inspired in classical Pilates. In contrast, its emphasis is on the duration of the exercise, intensity of the movement and targets the larger muscle group. Although the exercises are inspired on the original Pilates exercises,the workout promises to make you to sweat, lose weight, build strength quickly on the reformer. Neither the original Pilates principles nor the contemporary basic principles are required or taught in dynamic Pilates. Dynamic Pilates does not follow a set order of the Pilates classical repertoire. The workout fluctuates from instructor to instructor and from studio to studio depending on who is teaching. On the other hand, classical Pilates is roughly the same all over the world. Progression levels in dynamic Pilates are achieved by adding more repetitions, holding positions for longer periods, adding more resistance or reducing the loads on an unstable carriage and using some small weights. Dynamic Pilates will assure to get you to feel that burn in a circuit-style workout without lifting heavy weights, but on a reformer. However, many forms of exercise can deliver the same outcomes. In classical Pilates adding more spring tension on the reformer does not necessarily mean that the exercise will be more difficult. In fact many exercises are more challenging with less tension. This is because there carriage moves and becomes more unstable. Thus, spring tension is treated differently than conventional weight training. All things considered, both styles can be good. You must decide what its good for you depending on your fitness goals, musculoskeletal needs and more importantly, your personal taste. Moreover, it greatly depends on the teacher, it’s qualifications, experience and knowledge. If you are interested in “intelligent Classical Pilates” train with the best. Core Kensington incorporates modern principles in sports medicine and rehabilitation through the STOTT PILATES® method.